During an interview with a Yoga instructor for our Greece tours, I was asked what my yoga journey was? This began a train of thought, and I couldn’t quite verbalize at the time what Yoga meant to me. So I wanted to dedicate this blog to honor my story and to share with anyone who may be considering taking up a few minutes of Yoga each day. I recently received the best gift from my parents- The InstantPot! Imagine a pressure cooker, but better, faster and with easy-to-use digital buttons. It amazes me how easy cooking has become for us while cooking in developing countries continues to be a very physical event that takes up at least half of the day, usually a woman's. Since my service in the Peace Corps, I have prepared my favorite Cameroonian dish the way I was taught by locals whenever I had the time. When I decided to convert my Groundnut Stew recipe, I did some research (and by research, I mean lots of eating!) and I came up with the below recipe on my Everlast Rocketbook (a great way to easily upload hand-written recipes, lists and journal entries). In a society that tells us to hustle and bustle, I never realized how much I needed travel therapy until I started traveling. With each place I travel to, with new friends I make, I collect another piece of myself. I gain an entirely fresh perspective on the world. This last month Angel dedicated some time and energy into a passion project. Inspired by "Ain't Nothing Holding Me Back" by Shawn Mendez and the last 4 years we've traveled the world hand in hand, this is the final product! Unfortunately we don't have video from our travels through out Japan, Thailand, China or Cambodia! Don't forget to turn your speakers up and enjoy! Check out the following video we made of our recent trip to Lesvos, Greece! It was an unforgettable experience, to say the least! I’m still riding the high of emotions, breath-taking views, and the delicious fried feta pies. This month we successfully completed our first Crew Travelers' trip to Lesvos, where a group of strangers from all around the world became a family, as they joined together to help in the refugee crisis during the Dirty Girls Beach Clean Up. Of course we also took time to explore Molyvos, and fell in love with the Lesbians (C’mon, you didn’t think I would write grammatically incorrect sentences, did you?). If you care to read a more detailed account of our trip (and learn more about the refugee situation), check out My Big Fat Greek Adventure! While I recounted our trip activities there, I felt I needed to take a moment here to paint the picture that drew me in. Now, how to describe paradise adequately? If Lesvos was a box of chocolates, every one of them would be sweet. Everywhere you look, the ocean views are spectacular. Everything you eat is delicious.The Aegean ocean is amazing for swimming in June, and the weather is just lovely. Every road is interesting. Every restaurant cat purrs with affection at your feet. Every person I asked for directions provided me with a friendly, elaborate explanation of how to be on my way, and would then smile and wave as I backed up, blocking traffic going the other direction as I continued on. No honks or dirty looks. What I noticed were people laughing a lot. I sensed a happiness, love and kindness in the people of Lesvos. The olive trees always shield you away from the direct sunlight, but you still feel the sun. The sunsets are always gorgeous. The blooming flowers scent the air with a naturally sweet fragrance that even make your nose buds happier. I’m still riding the high of emotions, breath-taking views, and the delicious fried feta pies. This month we successfully completed our first Crew Travelers’ trip to Lesvos, where a group of strangers from all around the world became a family, as they joined together to help in the refugee crisis during the Dirty Girls Beach Clean Up. Of course we also took time to explore Molyvos, and fell in love with the Lesbians (C’mon, you didn’t think I would write grammatically incorrect sentences, did you?). If you care to read a more detailed account of our trip (and learn more about the refugee situation), check out My Big Fat Greek Adventure! While I recounted our trip activities there, I felt I needed to take a moment here to paint the picture that drew me in. I woke up one morning in April to a calling, a direct line to my heart from the universe. As a citizen of the world, I knew that I had to do something with the passion and outrage stirring within me over the global refugee crisis the world has been watching. After all, we are all connected through our humanity. It was time to go see it for myself, and to create a space of opportunity for other airline crew who want to do the same. Continue reading below! I was welcomed with open arms to volunteer with Dirty Girls of Lesvos, a wonderful non profit organization that washes clothing and other items to recycle back into the hands of refugees who need these supplies. Alison, Founder, recommended a great family run hotel, and like that I booked some rooms. The itinerary was neatly woven together after discovering island charms such as the Healing Springs and historic Molyvos castle, and thanks to a lot of assistance from Aphrodite Hotel. Within a couple of weeks, more than a dozen travelers signed up for the trip, and I realized that this calling was not just my own. 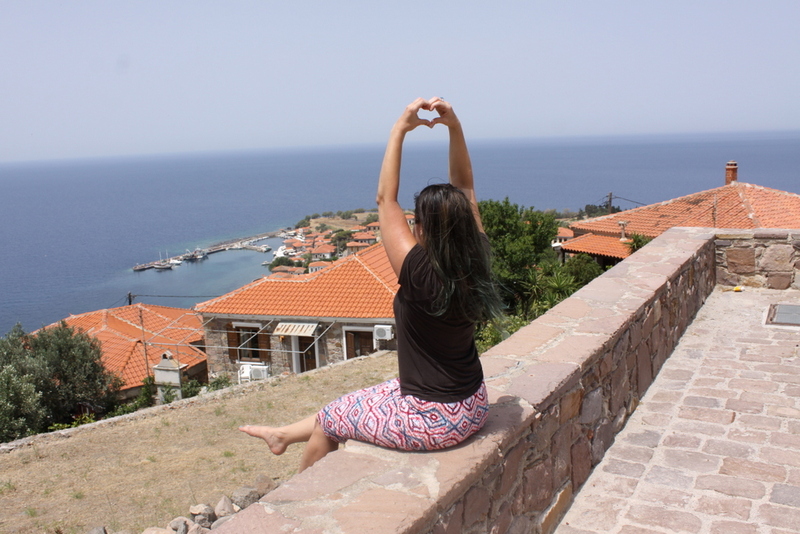 With big hearts and smiles, 16 of us found each other on the island of Lesvos! The drive into Molyvos was lovely, a twisting curvy road that leads you through cities and across the island, until we came upon Molyvos, a beautiful enchanting town with a castle at the top of the mountain! Our hotel was just behind the mountain, facing a beautiful beach. Our first activity on the itinerary would be eating a dinner at the hotel taverna, meeting with Alison of Dirty Girls, and to see a photo slideshow by Aphrodite herself. We needed to know more about the refugee crisis, and how we could help. I woke up one morning in April to a calling, a direct line to my heart from the universe. As a citizen of the world, I knew that I had to do something with the passion and outrage stirring within me over the global refugee crisis the world has been watching. After all, we are all connected through our humanity. It was time to go see it for myself, and to create a space of opportunity for other airline crew who want to do the same. It was late when we arrived, and when we arrived at the crew hotel, we quickly changed and ran out the door to explore the city. Most places were closing or closed but we got a chance to hit up a little restaurant called Las Vegas and enjoy some wonderful Cuban food! Then we went out and found a little hookah spot! It was a wonderful night! I remember us planning this trip, and being so excited to visit bourbon street! Sadly that never happened because we ended up having a short layover and we were too far from downtown to even make the attempt. We've since been there but I remember we were both disappointed that we didn't make it out! I remember us planning this trip, and being so excited to visit bourbon street! Sadly that never happened because we ended up having a short layover and we were too far from downtown to even make the attempt. We’ve since been there but I remember we were both disappointed that we didn’t make it out!